Next to my job as business counsellor and coach I am especially the wife of a CEO and mother of our child. 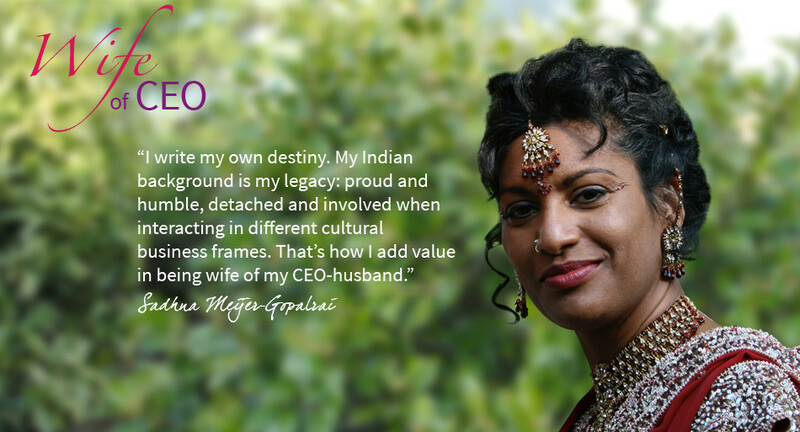 I myself have experience with seeking a sustainable position that gives life a meaning in the position as a CEO wife. I’m the one who provides a safe home base but I am also the companion of my husband during business trips abroad. Consequently, I am also his firstline ‘second opinion’ at business decisions that are often reflected in late evening hours. Develop a strictly personal part of your life. If you have a passion next to your working life that apparently has nothing to do with it, you are fortunate! Throughout my career, Indian temple dance has always been my greatest passion. This part of me offers reflection, energy and joy, even in times when the odds were against me. You used to be creative / artistic in dance, music or writing before you focused on being spouse and mother? Now is the time to make a step towards that powerful creative part of you! I know that there are numerous women in my position who are not happy with this role in marriage – or don’t come out well and are heading for problems. From that awareness I have developed a concept whereby this group of women can be supported. I would love to show you the way to a more valuable fulfilment of your life.